"Heavenly Autumn Casserole, Fall In A Pan - or maybe even Fall In A Pan with Heavenly Autumn Casserole"
Two of my favorite name suggestions from my lovely friends, and of course one by yours truly. Truth be told, I had the hardest time titling this nearly perfect autumn inspired dish. I say nearly perfect because I'm trying to be humble and act like we didn't already eat over half of the dish, between the two of us! When recipes have a number of components to them, I often get too excited and just try to squeeze everything into the title. I applaud food bloggers for having the creativity and discipline to keep things short and sweet. 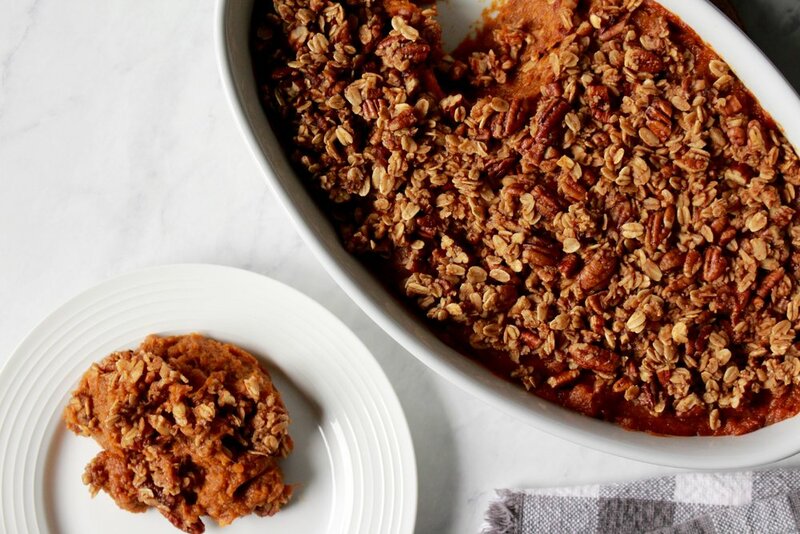 If it were up to me, I would've titled this something like "Heavenly Healthy Sweet Potato Pumpkin Perfection Pie with Cinnamon Maple Pecan Streusel Crumble." Clearly not reader (or SEO) friendly, but I just want to tell you all about the goodness of this dish, right from the beginning. I want all of my readers and friends to know, I will never title another recipe with the word "healthy." Giving a recipe this title, stigmatizes it as being something more worthy to the body, or something you should choose if you want to lose weight. Giving a recipe this title deems it "better" than your grandmas wholesome version or that one time you went out with your gal pals and someone ordered the real deal. Giving a recipe this title divides food from emotion, enjoyment, and communion. We begin to compare everything on a scale of "healthy and unhealthy" or even worse, "good or bad." Food has become so estranged to many of us; we no longer associate health foods with whole grains, fruit, vegetables, and animal proteins. We associate it with gluten free breads, sugar-free cake, and fat free butter. When I first started recipe blogging, I loved the idea of making not so healthy recipes, healthy. I wanted to "enjoy" my favorite foods, without feeling guilty about it. I cut out butter and replaced it with apple sauce, I cut out sugar and replaced it with stevia, and I cut out milk or eggs and replaced it with a nut milk or more apple sauce. What I did not realize at the time, was that I was never really enjoying anything about these "healthy" recipes, I was just trying to convince myself that "diet" foods were more comforting than ingredients with some integrity. Many years later and many recipes wiser, I have come to the conclusion that the definition of a healthy or "healthified" recipe, doesn't have to exclude real food. For example, when you think Paula Deen, chances are, you think "butter." And while yes, too much saturated fat can have an affect on the body, I personally believe a little bit of natural saturated fat is better than a whole lot of chemically created and processed butter alternatives. When you come to my blog, whether it be for a recipe or hint of my life, I want you to know that I only publish what I preach. My recipes are made with real food ingredients that the body can recognize and use. They are not intended to contribute to any fad diet, promote restriction of any food, or keep you from enjoying your grandma's famous dish. I encourage you to always remember, there is room for a little bit of everything in a health-conscious lifestyle, food is so much more than "good or bad," and living and enjoying the moment is truly the most important part. Though I might need to work on titling, I am confident in my message and I aspire to spread the word in all the ways that I can, starting with this (nearly perfect) recipe. Sweet potato casserole has been highly requested in our household since the temperatures dropped below seventy degrees. I am more of a pumpkin pie kind of gal myself, but I can never pass up a warm, sweet, and creamy kind of dessert/side/no one really knows. So, I figured why not kick off our autumn inspired recipes here on The Healthiest Me, with a delicious, nourishing and super easy fall classic. To begin, preheat the oven to 375 degrees and bake the sweet potatoes for one hour, or until soft. You can also substitute canned sweet potatoes (100% pure sweet potatoes) in this recipe if needed. Once the potatoes are cooked, set aside to let cool. Bring the oven to 350 degrees and lightly grease a baking dish. I used a deep oval baking dish, but any 8x8 (or 9x9) dish will do. Once the sweet potatoes have cooled, carefully peel off skin and place in a large mixing bowl and mash until smooth. Add in pumpkin, maple syrup, vanilla extract, and cinnamon. Continue to stir until all of the ingredients are fully incorporated. Set aside. Using a separate mixing bow, bring the pecans, oats, brown sugar, maple syrup, cinnamon, and sea salt together for the crumb topping. Carefully pour the casserole batter into the baking dish and spread evenly. Sprinkle a thin layer of the crumb topping over the casserole and gently pat down. Add another layer and again pat down the crumble. Any extra topping can be added as desired. Lightly cover with tin foil and bake for 45 minutes. For a crispier brown topping, continue to bake for an additional 10 minutes uncovered. Remove from the oven and cool slightly before serving. I hope you all love this recipe as much as we do. A huge thank you to everyone on Instagram that helped finalize this delicious recipe! I couldn't have done it without you!